NOT another Conference but A HEART SPACE to “talk story” with our elders to learn practical tools to face the coming changes or “Purification,” as the Hopi say, that is required before Mother Earth can birth the 5th World. This may be one of our last chances to meet personally and share with these respected elders before the Purification begins. Do not miss this unique chance in Sedona’s special energies! In-depth teaching by Native American elders – one for each of the 4 Directions, including Flordemayo (Maya), Auntie Pua (Hawai’i)… plus Grandfather Martin, traditional Hopi elder, representing the “Center” here in this sacred land and Grandma Agnes Baker Pilgrim of the Pacific North-West. Willard and Marie Pine of the Ojibwa nation from Lake Superior will represent the East. 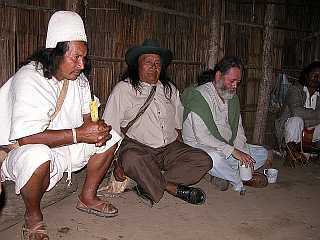 We also will have the participation of Inca shaman, healer & musician, Wachan, and his wife Martika. An extra bonus is the participation of a representative from the legendary Kogi~Arhuaco (“The Elder Brothers”) the 2 key tribes from Colombia. Rev. Michael Beckwith & Rev. Rickie Byars Beckwith. Participation by Synergy, an ancient quartz crystal skull with Sherry Whitfield Merrell. Crystal skulls represent our wise ancestors and have long been used in sacred ceremonies by indigenous people, especially in Central & South America and Tibet. Co-produced by Karen Koebnick of Sedona Spiritual Journeys. A presentation by the Kogi, Arhuaco, Wiwa, and Kankuamo indigenous groups from the Sierra Nevada of Santa Marta, Colombia. These elders are appearing outside their country for the first time to present their urgent appeal on environment, land, and culture. • Four indigenous groups totaling 50,000 persons live in Colombia’s Sierra Nevada de Santa Marta, the world’s highest coastal mountain (5,775 meters/18,946 feet). • Their traditional territory, which they believe is the “Heart of the World,” includes snowy peaks, cloud forests, rain forests, coral reefs, mangrove swamps, deserts and almost every sub-climate in the world and is delineated by a series of sacred sites. • The indigenous peoples (Kogi, Wiwa, Arhuaco and Kankuamo) practice 1000 year old traditions that predate the arrival of the Spaniards and are one of the most authentic and unaltered surviving civilizations of pre-Colombian America. • Today, an estimated 220,000 non-indigenous people have settled in the middle and lower portions of the Sierra Nevada. Many are refugees from the violence of the Colombian conflict. • The loss of their traditional lands, encroachment into areas where they currently hold title, the advancing agricultural frontier, illicit crops, climate change, the western vision of progress, and the conflict in Colombia have all contributed to the destruction of 72 percent of the area’s original forests, depletion of rivers and streams, loss of biodiversity, and soil erosion. These factors threaten the future of this territory and its people, and jeopardize the water resources upon which 1.5 million people and the area’s agro-industry and tourism sectors depend. • Despite considerable progress over the past several decades in creating reserves to safeguard the land rights of the indigenous groups, only one third of their traditional territory—or 14.8 million acres (6 million hectares)–has legal protectionas “resguardos”. • Lands that have been legally returned to these groups have undergone significant environmental renewal, have helped to improve the living conditions of the indigenous population and strengthened their cultural systems and traditional organization. Of the total amount of territory acquired through legalization and extension, 70 percent is dedicated exclusively for natural regeneration and ecosystem and water resource conservation. • These indigenous peoples have set a goal to recover an additional 835,216 acres/338,000 hectares of their traditional territory over a 20-year period. Their initial goal is to recover 210,000 acres/85,000 hectares where their main sacred sites are located. This proposal would greatly contribute to water resource and biodiversity conservation that is crucial for the entire region. • They are requesting international support to raise $15 million for an Indigenous Fund to acquire this land. The Fund will be jointly administered by the Consejo Territorial de Cabildos (CTC) (the Indigenous organization) and the United Nations Development Programme (UNDP). • The program will be carried out in accordance with a previously established framework agreement signed by the CTC and the Colombian government. • The purpose of the Indigenous leaders’ visit to Washington, D.C. and New York City is to disseminate their message and enlist support for funding to acquire and recuperate their traditional territories. The visit, which is historically unprecedented for these peoples’ traditional authorities, is being facilitated by the Inter-American Development Bank (IDB) and the UNDP. • The Inter-American Development Bank is committed to supporting the development aspirations of indigenous people while protecting their identity and individual and collective rights. • The IDB’s Indigenous Peoples and Community Development Unit was created in 1994 to define ways in which the Bank can achieve development with identity of indigenous peoples and to mainstream indigenous issues throughout the institution’s project portfolio. • The vision, objectives and priority areas of the IDB’s work in the area of indigenous issues are set forth in two documents: the Strategy for Indigenous Development and the Operation Policy on Indigenous Peoples, that entered into force in August 2006. • For further information on the Bank’s work in this field, please see http://www.iadb.org/sds/ind. Develop Goals programs and objectives; it support the adoption of the recommendations made by the United Nations Permanent Forum on Indigenous Issues and the Special Rapporteur for Indigenous human rights; and it promotes the development of national policies and programs with a specialized approach and protection of rights. • The UNDP focuses its support for Indigenous peoples in the following areas: institutional strengthening, establishment of territorial rights, promoting the role of traditional practices in confronting humanitarian crises, and establishing links between indigenous organizations and national government institutions. • The UNDP has proposed strategic areas of support for Indigenous peoples in the document UNDP and Indigenous Peoples: A Policy of Engagement. Peoples and Community Development Unit (anned@iadb.org) in Washington, D.C.
Free Media 4 Our Elders, A Voice 4 the Future. The Kogi-Wiwa-Arhuaco Reserve, home to several of Colombia’s indigenous groups, are the ultimate losers in the ongoing civil war that threatens to take from them what is left from the passage of time. The Kogi-Wiwa-Arhuaco Reserve, an area containing several indigenous towns in Colombia – Bunkwimake, Gúmake, Jiwa Chivilongui, Acleyzhi, Ulueyzhi, Goksheyzhi, Kemakumake and Kalabangaga – still constitutes an intact pre-Columbian high civilization, one that has survived both Spanish and industrial colonizations over the course of time. The natives belonging to this country have preserved their ancestral ways of life, maintaining a rich culture and continuing in the education of their so-called “Mamas”, priests of the Kogi nation, wise men trained since their childhood both to preserve and work in the spirit world. The Kogi area is one of those indigenous populations that belong to Colombia , a country not simply going through a situation of internal fighting, but suffering a civil war. The same kind of civil war that, for whatever reasons, we have seen in many countries. However, the case of Colombia is different in one respect. The complicated array of numerous warring and quarreling groups has trapped within it an equally diverse number of indigenous people, who have essentially nothing to do with the current internecine situation, a situation that is part of a world they simply do not belong to. What has not been eroded with the passage of time is in danger of being eradicated by warring squads, all products of national chaos and violence. According to Danilo Villafañe, a representative of the Kogi community acting under an organization called “Gonawindua Tairona”, heavily armed men, apparently members of the Self-Defense Union of Colombia (AUC), invaded part of the northern coastal province of Magdalena (which includes part of Sierra Nevada de Santa Marta), where the Kogi nation and other indigenous tribes live. Mr. Villafañe explains that the Kogi had never sought help before. Not so now. They are presently trying to bring their appeals to the attention of the President of Colombia through simple letters, as well as seeking to attract the attention of human rights organizations. Upon actually reading those letters, one realizes the simple validity of their claims, asking for the rights that are intrinsic to humans irrespective of their level of civilization or development. They ask for the simple right to live. But in a war, the right to live –the most basic right of all – does not turn out to be a valuable one. It is as devalued as the bank accounts of those enduring the war from the vantage point of a more ‘advanced’ civilization. This entry was posted on May 8, 2007 at 4:54 am and is filed under Uncategorized. You can subscribe via RSS 2.0 feed to this post's comments. You can comment below, or link to this permanent URL from your own site.